Well, it has been a wonderful year in 2014. This was my first full year of officially being in business. I learned quite a lot! I began with getting professional photos made, which lead to creating this website, submitting applications to art guilds and local stores, and updating my Etsy shop. 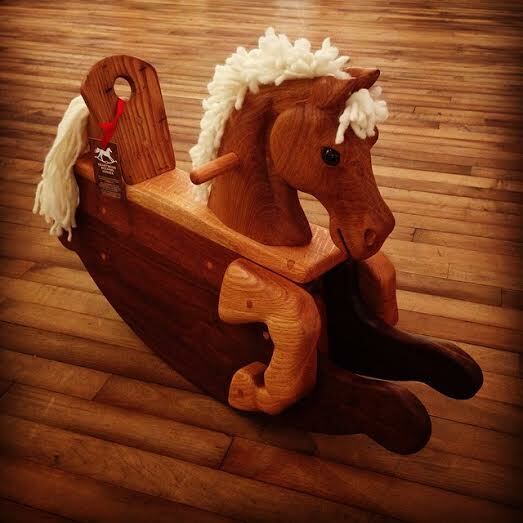 I have fine tuned my designs and carving skills, and am so proud of the finished product of each horse I make. I have sold horses all over the states, from Hawaii to Arizona and New York, and even Canada! I have also discovered a few different techniques that I will use in the next year. Here’s a few changes that I will make; small, but fun to incorporate and share with all of you! I have discovered a new, food-grade, non-toxic, all natural oil that is much more durable, dries faster, and looks better than the raw oil I have been using. It is partially polymerized linseed oil, and I have been using Tried and True Danish Oil on the last several horses with great results. This is not the same as boiled linseed oil, which contains heavy metals to aid in drying. Also not the same as traditional Danish oil, which can contain synthetic materials or dryers and takes at least 30 days to cure and become food safe. The Tried and True linseed oil has been partially heated over time, causing partial polymerization without metallic or chemical additives, and speeding the drying process once you apply it to wood. And it is safe for me! I may try some of the other Tried and True natural finishes as well in the future. create the wide rockers, which I previously made from plywood. It is beautiful, and is very popular. Walnut, however, can be a difficult wood to find in the reclaimed lumber world. I may be able to use oak instead, though the dark walnut is a great color contrast to an oak or poplar horse head. I talked with a local small-scale lumber mill in the area (Bee Tree Hardwoods) about buying sustainably harvested lumber, instead of reclaimed lumber, when the reclaimed supply is low. What I learned is that it can be very hard to become officially certified in the sustainable lumber industry, and that the certification is usually used for exotic or endangered wood species. This lumber yard often uses urban harvested trees from construction lot clearing or downed residential trees. I like this. Also, they claim that most lumber growers use sustainable practices because it is in their best interest to take care of the land and keep the trees healthy and growing for generations. This makes sense to me, though I don’t know much about the industry and haven’t done much more research about it. But there is a chance I may use lumber from this local mill if reclaimed lumber is not available. I trust that is comes from near by, and is harvested ethically and sustainably. I will still use only reclaimed lumber as much as possible, and will of course use it for customers that prefer using only reclaimed materials. 2015 will be my first full year of creating horses full-time. I hope to reapply to the Southern Highland Craft Guild in May if I can create 5 new horses. I also hope to apply to a few other artist guilds that promote annual or semi-annual art fairs. I learned this past year that online sales were greater than local in-store sales. I would love to learn if the art fair market would be another good market for the horses. I am also making my first custom horse sculpture that will stand alone without rockers. I hope to expand the options of horse related creations, including mounted carved heads, wall hangings, or book ends. I’m open to all your imaginative ideas! Thanks so much to those of you that have taken interest in Heartwood this past year! I love hearing from you! And it is always my greatest joy to hand deliver horses and see people’s reactions and joy in seeing the horses. There is something special about horses, about hand crafted wood creations, and about working with other people to put their dreams into reality! I love every minute, and hope children love their horses as well! Have a wondrous, imaginative and creative New Year!